Today we're featuring Jackie Robinson's Rose Block featuring her upcoming collection, A Festival of Roses. 1. 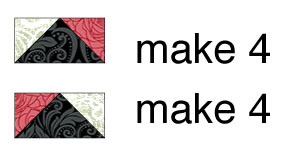 Draw a diagonal line on the wrong side of (1) 2" Black Damask squares. Position the marked square right sides together on (1) 2" x 3-1/2" Festive Lace Green rectangle. Sew on the drawn line, trim seam allowance to 1/4", and press open. Make (4). 2. Repeat step 1 on the opposite end to make a flying geese unit. Make (4). 3. 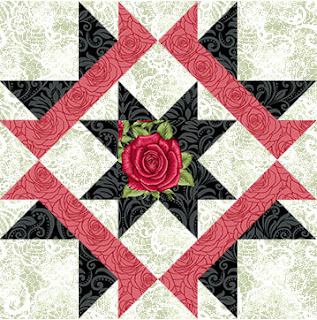 Sew (1) 2-3/8" Outline Rose Red triangle to (1) 2-3/8" Festive Lace Green triangle along the diagonal edge to make a half-square triangle unit measuring 2" square. Make (4). 4. 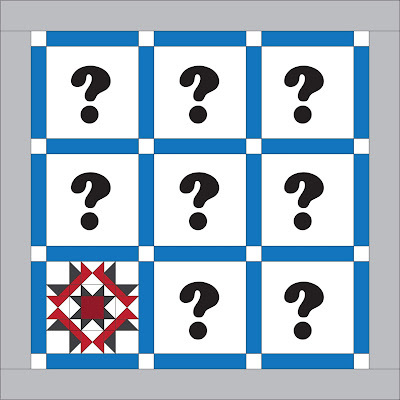 Lay out (1) 3-1/2" Festive Damask Black square, (4) flying geese units, and (4) half-square triangle units in (3) rows of (3), noting orientation of each unit. Sew the units into rows and join the rows to make the block center. 5. Lay out (2) 4-1/4" Festive Lace Green triangles and (2) 4-1/4" Outline Rose Red triangles as shown. Sew the triangles together in pair and join the pairs to make an hourglass unit. Make (4). 6. 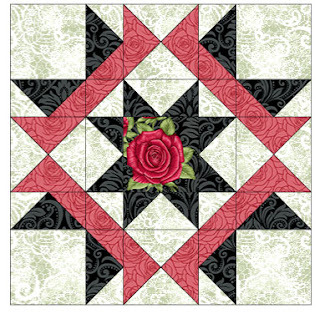 Following steps 1 and 2, use 2" x 3-1/2" Black Damask rectangles, 2" Festive Green Lace squares, and 2" Outline Rose Red squares to make (4) flying geese units with the red triangle on the right. In the same way, make (4) additional flying geese units in reverse, with the red triangles on the left. 7. Lay out the block center, (4) hourglass units, (4) flying geese units, (4) flying geese units in reverse, and (4) 3-1/2" Festive Lace Green squares into (3) rows of (3) as shown. 8. Sew the units into rows and join the rows to complete the 12-1/2" square block. 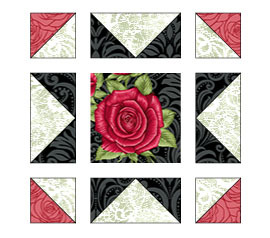 Click here for a preview of Jackie's A Festival of Roses fabric collection. 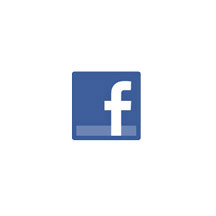 Click here to visit Jackie's website. This block is really beautiful with this fabric. (I tried to go to Jackie's website, but the link didn't work so I was wandering if you could put the patterns in a PDF. I would love to download these blocks to make later. Hi Joyce, at this point we don't have plans to put the patterns in a pdf. We'll let you know if that changes. Thanks! 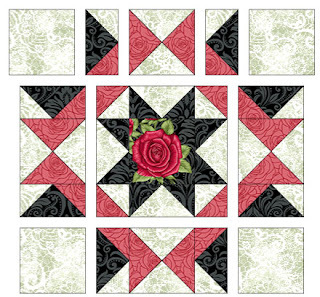 Love this block and the fabrics!